Another well done snuff by Jaxons. 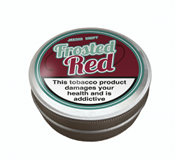 This can is a mentholated fruity snuff that is easy to take while able to enjoy a nice fruity flavor. The menthol is easy in presence and not overwhelming. After the initial menthol presence, it ends with a cherry sort of spice flavor that is wonderful. If you are a beginner looking for something to start on, you can't go wrong with Jaxons. A bargin for the size of tin - gives a nice hit but seems "dry" . You get both the cherry and menthol flavours andvis not too harsh for me a novice to snuff taking.